Jeremy Corbyn, the newly elected leader of the Labour Party in the UK is being received with much acclaim. The party has grown by 14,500 members since he was voted in on Saturday, September 12. Here is a clip of what he had to say at his victory speech. JEREMY CORBYN: They’re fed up with the inequality, the injustice, the unnecessary poverty. All those issues have brought people in in a spirit of hope and optimism. PERIES: The membership of the Labour Party is growing hourly since his victory and currently standing at 325,000, the highest it’s been since 1999. As one of his first acts, Corbyn has unveiled what he calls a unifying new shadow cabinet. He named John McDonnell, his campaign manager, as a shadow chancellor, and the man he defeated, Andy Burnham as shadow home secretary. In his cabinet just about half of the total posts went to women, including shadow defense, education, business, and health ministries. Here to discuss all of this I’m joined by John Weeks. John is the author of The Economics of the 1%: How Mainstream Economics Serves the Rich, Obscures Reality, and Distorts Policy. John, great to have you with us today. JOHN WEEKS: Thank you for having me. And I don’t have a tie on because Jeremy never wears a tie, so I figured I should be in costume for this interview. PERIES: You’re joining the Syriza [corps]. John, let’s just begin with his victory, and you describe it to me, the jubilation people felt on the floor of the convention. Tell us more. WEEKS: Yes. Well, on the 23rd of June I had a meeting with a man who had come up with [inaud.] John McDonnell, and we were–it was a group that was looking into, that he’d formed, looking into economic policy. And so we’d planned to have our meeting two weeks later. A week later, John McDonnell said, I have to cancel all of this because I’m organizing the campaign of Jeremy Corbyn. I think all of us felt, well that’s, you know, that shows John’s heart’s in the right place. But as soon as that’s over we’ll get back to the real business. I think no one dreamed that there would be such an outpouring of enthusiasm. It must be something similar with Bernie Sanders. But the first straw poll taken of Labour Party members showed that Corbyn was going to win by about 55 percent, and his strength just grew. And people all over–I mean, I keep running into people. I have a friend whose 17-year-old son went along–never had anything to do with politics–went along to the phone banks for Jeremy Corbyn. And again and again I meet people who say, this man talks straight. And it is just a fantastic development in Britain. When the event itself was held where he was, it was formally announced that he had won, the crowd in the Queen Elizabeth II hall went berserk. I mean, it was as if Christmas had come a few months early, and everybody got a present. And the present was a progressive government by someone who I think is very unlikely to change his views in any dramatic way as the campaign goes on. As his work as leader goes on. PERIES: John, you’ve been advising the party on its economic platform. Give us a sense of what he stands for and what you’ve been working on. WEEKS: Yeah. I would say first, he is committed and the new, the shadow chancellor, are committed to no cuts in education and the health service. And if–and those were, they’re planned by the Tory government and the Labour will oppose them. As a matter of fact, if they come to power they will restore many of those cuts. One of the more controversial proposals he has made is in public investment. Infrastructure. Which he would fund through borrowing, which only makes sense now. I mean, the rate of inflation in the UK at the moment is very slightly negative. The idea that borrowing would stimulate inflation, I think one’s response has to be let’s hope so, because we’re on the verge of deflation. So I think it’s a public investment, and also his promise to raise the rate of income tax on the wealthiest so the taxes become more progressive, to shift from value-added taxes to income taxes and corporate taxes, which is a very dramatic change because the entire European Union pressing for it, whether it’s a bureaucracy, is pressing for more sales taxes, value-added taxes, to replace income taxes. The exact opposite of what Jeremy Corbyn wants. And I think all of those things together give him a radical appearance. But actually it’s not very long ago that these were standard policies. Progressive income tax, public investment, fully funding health and education. These, they only look radical because we’ve been in such a tremendously reactionary period for so long. PERIES: So John Weeks, one of the criticisms launched against Corbyn is he wasn’t very effective at unifying the party and leading it in a way that would not alienate the other, more center part of the party. What do you make of that, and where do you think the party will be taken in the next few months? WEEKS: First a little very quick background. When Tony Blair became leader of the party, the Labour Party was overwhelmingly social democratic. And Blair set about to reconstruct the party as a neoliberal party. And he did it ruthlessly, and he made very little attempt whatsoever to do it in a way which was inclusive. It would be very difficult for Corbyn to be as divisive as Tony Blair was. I think that at the same time, we have to recognize that there are very conservative elements in the Labour Party. And if we’re going to have a progressive government in Britain–despite my accent I’m [not only] an American citizen but a British citizen, so I would vote in any election. If we’re going to have a progressive government in Britain, a Labour Party–the tension, the conflict, must be worked out. There’s no way to get around that. Any compromise that brings the whole, so-called–brings together the entire party will necessarily so water down Corbyn’s program that it wouldn’t have been much point for him to challenge for the leadership to begin with. PERIES: Now, one of the issues that the entire European community is faced with right now is of course the refugee crisis. This weekend there was a day of action held on the refugee–responding to the refugee crisis. Can we have a look at what he had to say. 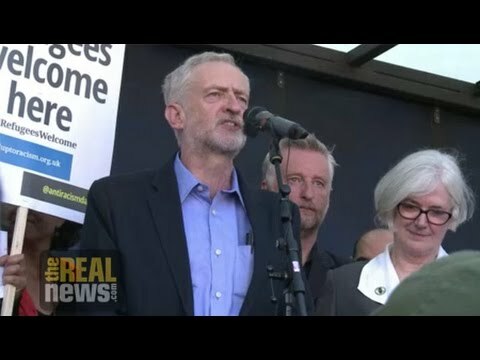 CORBYN: Open your hearts and open your minds and open your attitude toward supporting people who are desperate. Who need somewhere safe to live, want to contribute to our society, and are human beings just like all of us. Together in peace. Together in justice. Together in humanity. That surely must be our way forward. Thank you very much for inviting me today. PERIES: John, his speech on the day of action on refugees was well received, from what we can hear in the crowd. What do you make of what he said, and what does the rest of Britain think about what he said? WEEKS: I think that the first thing you have to note is that isn’t it remarkable that from the announcement that he had won, he went straight to that demonstration. He marched in it and then he spoke in it. And that gives you an indication of his commitment to progressive policies. I should say that in addition to his refugee policies, which are coming on the moment, he is something that would seem very strange in the United States. He is anti-Zionist, and he supports the right of Palestinians to return to their land. And that is a very brave position to take, a very principled position to take. And many people in Britain support that position. It might even be that the majority of people in Britain support that position. But I would say that there is a very open, a great openness to the refugee problem. Immigration is somewhat a different issue, and I’ll say something briefly about that. But with regard to refugees, people fleeing conflict, I think that there’s overwhelming support for helping those people, except from the very far right. Even the head of the nativist UKIP, United Kingdom Independence Party, came out in favor of providing help for a limited number, but still providing help for refugees. But this is not the same as the immigration issue that–most of the immigration in Britain is from other European Union countries, and that is quite–is much more controversial. PERIES: And finally, John, give us a take on what the new shadow cabinet looks like. I referred to the fact that it was over 50 percent women, which is a step in the right direction for a leader of the Labour party. But give us a rundown on what else it looks like. WEEKS: I think that the–Corbyn has been conscious of the need to bring as much of the party together as possible. So those people who are progressively-oriented but did not support him are in the cabinet. Andy Burnham, who was one of his opponents, is in the cabinet. And several other people whose names would probably not mean anything to Americans, they’re less well known. Already there’s been some criticism of him from women for appointing a man as the chancellor of the exchequer, shadow chancellor of the exchequer, because that is generally considered to be the most important cabinet post. Corbyn has said that that will all change under him, that the chancellor will no longer have the role, play the role, of sort of the super cabinet member, which it has been in the past. So I’m—needless to say, I’m quite optimistic. I know many people in the United States that are going to email me saying, well, isn’t this wonderful? But isn’t it so suicidal on the basis of the Labour Party [inaud.] may be principled and outspoken, but he can’t be elected? What I would say to people about that is first of all, the election is four and a half years off. The important question is, beginning this week, will Jeremy Corbyn be an effective leader of the opposition? Which is what the leader of the Labour Party has to be. And if he is, that will lay the basis for electability in 2020. And also, if your position is, some narrow concept of electability is what’s motivating you, well, then I guess you wouldn’t vote for Bernie Sanders and you wouldn’t vote for Jeremy Corbyn because they are, they are both intending to change the public’s mind. And I think the public’s mind is changing. PERIES: John, it’s a long road till the next election. We hope to follow it along with you. Thank you so much for joining us today. WEEKS: Thank you for having me.